If you want to know how to be the best, you learn from the best. 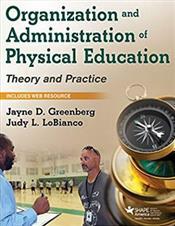 Two SHAPE America Physical Education Administrators of the Year share what it takes to be an outstanding administrator in Organization and Administration of Physical Education: Theory and Practice. Jayne Greenberg and Judy LoBianco, veteran leaders in the field with decades of successful administration experience, head a sterling list of contributors who have taught at the elementary, middle school, high school, and college levels in urban, suburban, and rural settings. Together, these contributors expound on the roles and responsibilities of physical education administrators through both theoretical and practical lenses.